My plan was to create a native MacOS experience (No boot camp) with as many Cuda cores as possible, so I could render in Octane for Cinema 4D. It has been very successful! I do plan to document and purchase another 1080Ti and Mantis Venus plugged into the same system. So, in the end, I will have x2 Mantis Venus eGPU enclosures and x2 GTX 1080Ti's, equivalent to 7168 Cuda cores. 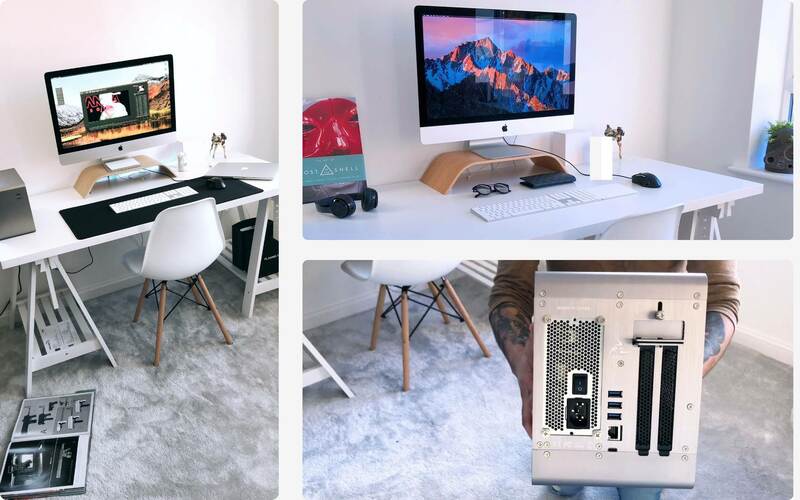 Then when the modular Mac Pro is announced, I will sell my iMac and switch over gaining another 2 PCIe slots for an additional x2 GPU's, along with my eGPU's, so hopefully 14336 Cuda cores! iMac Retina 5K, 27-inch, Late 2017, Kaby Lake 3.5 GHz Intel Core i5, 2TB Fusion Drive, 8GB 2400 MHz DDR4, AMD Radeon Pro 575 4GB, MacOS High Sierra 10.13.3. Mantiz Venus eGPU (Space Grey), ASUS NVIDIA GeForce GTX 1080 Ti, Belkin Thunderbolt 3 cable, Thermaltake RGB Silent Fan, Headless Ghost in HDMI for GPU acceleration. 1. Remove/undo any Info.plist modifications (they aren't needed anymore and might conflict). Many thanks to the eGPu community, you've made this process so straightforward and easy! If anyone has any questions at all on my build just let me know. iMac (Retina 5K, 27-inch, TB3) MacOS High Sierra 10.13.6. Did you get your 1080TI to work using your internal display only? Assuming that's why you purchased the Ghost Adapter. How did you get on with running octane? I'd be keen to hear. Ive got a very similar iMac, but my on board graphics card is an RP580... does that make any difference? @rb999 Yes, the 1080TI worked straight away and was recognised by the iMac in the Thunderbolt section of System Report. I only brought to ghost adapter to test if my IPR window and renders were faster. It did work, the IPR is significantly fast at times when the Ghost is connected but it's not necessary. Render times are pretty much the same with or without. Hi @woowah, I like Mantiz, they reply to all my messages and tweets on Twitter if I ever need help, It feels like a local company even though it's far away. Also, it doesn't hurt that it has many USB 3.0 ports and the design is great! I don't think your internal GPU will make much difference.